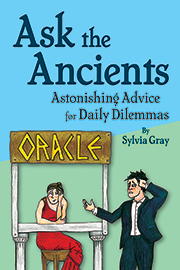 Ask the Ancients: Astonishing Advice for Daily Dilemmas by Sylvia Gray is a collection of fifty-two short essays about the classical world and its relevance today. The premise, char the problems faced by people in the ancient world-and the solutions they employed-can give us insight into solutions for the problems that people face today, is not something that students generally expect to discover when they first learn about the humanities. In fact, in the Introduction and Explanation, the author herself states that, having read as many works by authors from classical antiquity as she could get her hands on, she was "constantly surprised by the universal aspects of human experience that shone through." These universal aspects of humanity, told by the voices of the distant past, have the power to invite students to participate in twenty?five or more centuries of a conversation that's not over yet. Each article begins with the statement of a problem or question, followed by a catchy phrase as a sort of subtitle. The article presents the name of some ancient thinker along with his/her relative time and place in history. The, the students read a short paraphrase of the thinker's take on the issue, often presented with clever ways to think about the problem today. At the end of each short article is a brief reference to the source of the commentary. The book ends with a numbered bibliographical list of the translations used for each article. Teachers in high schools or colleges can use Ask the Ancients as background information to start conversations about larger issues that relate to students' lives. One way to accomplish this would be via collaboration with teachers of various courses such as Contemporary Issues, Civics, Health and Physical Education, Career Education, and Home Economics. By discussing with the teachers of these courses what upcoming topics are planned for their courses, Latin instructors using this book can make the kinds of interdisciplinary connections that keep students engaged. There is one important consideration for teachers planning to use a book of this scope. The ancient world was a complex era, and the ideas that students can discover are often nor the ideas that our modern world endorses. Ask the Ancients does not shy away from presenting these ideas and themes, making the work a more complete picture of ancient thought. Thus, teachers should read the articles ahead of rime and choose the topics and themes char suit their school communities so mar they can find the greatest success with this book as a classroom resource. The title is the motto: a both funny and instructive guide through human dilemmas by Ancient Greek and Roman authors. One can see that she—fascinated by a charismatic teacher in a classical history course—freely immersed herself in the richness of e.g. Homer's and Cicero's texts. Once she was "determined to read everything extant from antiquity" (p. ix) (a bigger undertaking than she had ever imagined), she began to teach history and to write an Ask the Ancients column. Now she has selected titbits of obviously translated excerpts —see the annex with all the translations she used mainly from the 18th and 19th centuries (not a bad idea). The compendium is not the first Greco-Roman guide to human essentials, BUT it sounds fresh: G. has a lively dialogue with the opinions, in a way I know from Marcel Reich Ranicky, when he dealt with German authors in "Lauter Verrisse" and "Lauter Lobreden". G. is not addicted to ancient authors, but seriously scans the texts for their effectiveness in the past and present. When she is dealing with "Where could I go to increase my chances of meeting available women?" a classicist would expect Ovid's "ars amatoria" and "amores" as an advisor, but Gray suggests Pausanias, an observant, scholarly, religious man who does not strike one as a sophisticated seducer of women. Pausanias suggests as a meeting point a nice sea resort, today's Patras, with a sanctuary to Aphrodite with a sacred grove by the sea "a delightful place for idling in the summer". Secondly, Pausanias suggests Patras, because there were twice as many women there as men, and "if ever women belonged to Aphrodite, they do. Pausanias's GUIDE TO GREECE 7.21)". Gray considers the effectiveness of Pausanias's advice for the present days: "Patras, as it is now called, is a bustling city of 150,000 and reputedly has a lovely walkway along the quay. But even if it is not on your next vacation itinerary, you may still put to use the principles Pausanias mentioned. First, choose a place where women "idle", preferably at a sea resort where there are rides you can enjoy (parasailing?). Secondly, do a bit of statistical research on the ratio between women and men before making definite plans for this potential spot (Caribbean cruises might be a good alternative). (Men: don't go to Alaska!)" (p. 31). G. intends not to teach scholars with her book, but to motivate the student "who desires to imbibe further" (p. x) It is impressive how in two pages Silvia Gray can create a psychograph of the warlord Caesar and modern managers, who want to motivate their discouraged troops (Maintaining Sales Morale pp. 8–9); this is ironic and thought-provoking at the same time. She climbs the summit of austerity together with Horace, when she answers the question "Should I save for the future or spend now?" with Horace's "most essential guideline: Vixi - I have lived", meaning "Save or spend? Enjoy your life, whatever Fortune brings your way"(p. 29). The booklet is suitable for non-specialists or high school teachers attracted by Classical programs, but could also seduce classicists to refresh their Canon: Soranus (p. 21) or Oxyrhynchus papyrus 744 (p. 71) are not really well-known. One may ask translated excerpts to be included or more precise citation, but the author does, where absolutely necessary (p. 71) and cuts them out, where internet research can be done easily (Pausanias, Caesar etc.). The booklet itself is well balanced: Lebensweisheit und Witz with a punch line. I would like to read more of the same. The individual entries are organized like an advice column where questions are asked by fictitious inquirers and answered by the author through a series of anecdotes from ancient literary sources. For example, the category "Career and Workplace" includes six topics: attaining consensus; climbing the ladder; personal hygiene; maintaining sales morale; overcoming stage fright; and poetry as a career. Regarding the subject of "stage fright" (pp. 10-11), "Trembling Tremolo" asks "How can I overcome stage fright when I give a musical performance?" The author responds by telling the story of how Nero overcame his own bout of stage fright by "conscientious" preparation (e.g., improving his vocal prowess by lying down and singing with a lead weight on his chest), hiring fans, and controlling his audience (e.g., preventing anyone from leaving the theater until the end of the performance).